About 5:00 a.m., 43-year old Asit Rathod set out to climb Mt. Hood and ski down. Asit had climbed Mt. Hood many times and should have known better, but he started up knowing that deteriorating weather was in the forecast. As the clouds moved in and visibility diminished, Asit continued upward. He eventually decided to descend somewhere around Crater Rock. Asit was not carrying a map, compass or any other navigation tools. On the descent, he veered to the west and wandered down to the cliffs of Mississippi Head. Stuck in dangerous terrain with no visibility, Asit called 911 around 9:00 a.m. After speaking with Asit, the Clackamas County Sheriff’s office contacted PMR at approximately 09:20. and asked that PMR standby. At 10:00 a small team was requested to assist Asit to safety. PMR fielded a team of three rescuers who departed Timberline at 1:00 p.m. on a snow cat. The snow cat ferried the team to about 7200’ under the Palmer lift but could not proceed higher. Visibility was extremely poor–not more than 5 feet. The cellular company was able to pull accurate coordinates from Asit’s cell phone; so the rescuers had a good fix on his location right at the top of the Mississippi Head cliffs. 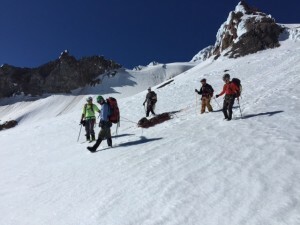 The team proceeded up to around 7800’ and traversed west above dangerous terrain. They then descended through an open snow field to the cliff area at about 7400’. Progress was extremely slow and stressful due to low visibility. The team made voice contact with Asit sometime after 4:00 p.m. and reached him about 4:30. They gave Asit hot chocolate and a snack and assessed his condition. Asit was strong enough to travel, so they headed back up so they could traverse east to the Palmer lift area. Visibility remained near zero and progress was slow. Asit’s skins were iced and would not adhere to his skis, so the rescuers fitted him with snow shoes. They eventually reached the Palmer lift sometime after nightfall. From there, they slowly skied down under the lift using their headlamps. They rendezvoused with a Timberline snow cat a few hundred feet above Timberline Lodge. 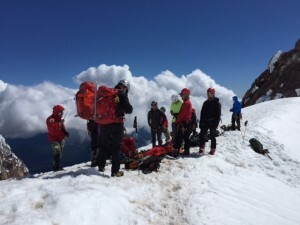 They returned to Timberline Lodge at approximately 7:45 p.m. This rescue ended well, but could have had a tragic result. 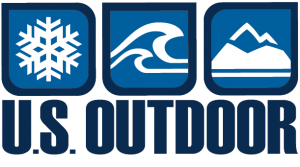 PMR urges climbers and back country skiers to respect the difficulties of traveling, and even surviving, in bad weather above tree line in the Cascades. When clouds or snow showers move in, navigation is impossible without a map, compass and GPS. 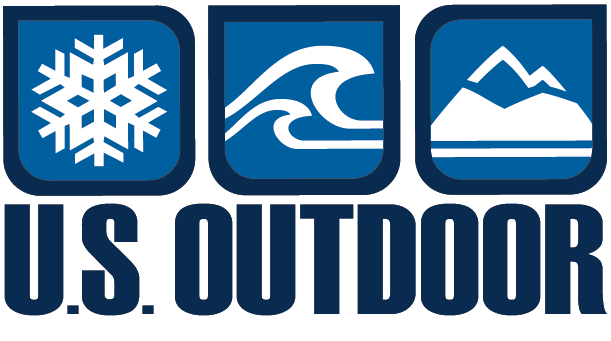 We also encourage back country travelers to enjoy their experience with a buddy or two. KGW provided good coverage of the mission.